Welcome to Tylden Primary School. Our school has provided a comprehensive and high quality education to children in the local community for over 150 years. The school has a fine reputation in the local area as a friendly and welcoming place where children achieve their full potential. Our students are motivated learners who are curious, articulate, socially capable and well equipped for the future. 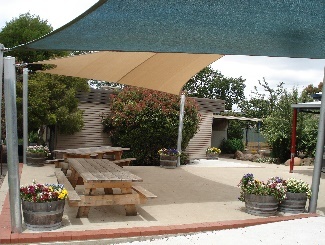 Tylden PS is situated in the picturesque township of Tylden in the Macedon Ranges Shire. It is a school of choice for local families, and also for families living in nearby Kyneton, Woodend and Trentham and in the rural areas of Glenlyon, East Trentham, Drummond, Lauriston, Fern Hill and Spring Hill. Families are attracted by the pleasant, rural environment and they value the strong sense of community and pursuit of high academic standards. Students particularly enjoy the spacious grounds and gardens that are so conducive to play, exploration and relaxation. These beautiful surroundings are meticulously maintained by the members of our school community. The family/school partnership is strong at Tylden PS and there is an enduring tradition of parent/carer involvement in classroom and extra-curricular activities. The pride our community has for our school is evident everywhere. I am extremely proud of our vibrant learning community at Tylden PS. I am proud of the achievements of our students, the high quality of our staff, and the warmth and friendliness that is renowned locally. I extend a warm invitation to pay us a visit and see our school at work and play. Our school leaders conduct school tours during the School Open Days in May, or you can make an appointment for a school tour at another suitable time. Copyright © 2000- Tylden Primary School. All rights reserved.